Houston Astros defeat the New York Yankees 4-0 to advance to the World Series for the second time in franchise history. 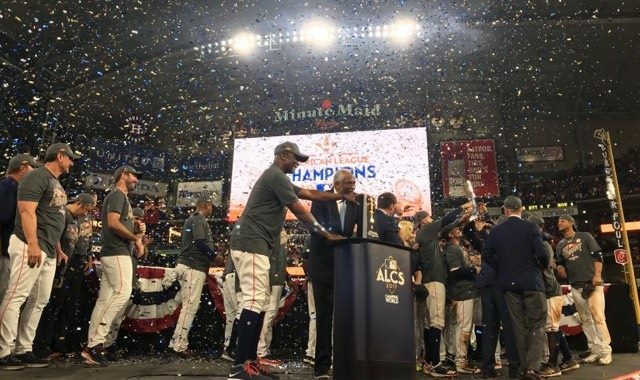 Charlie Morton and Lance McCullers combined for a three-hitter, Jose Altuve and Evan Gattis homered and the Houston Astros reached the World Series, blanking the New York Yankees 4-0 Saturday night in Game 7 of the AL Championship Series. Next up for the Astros: Game 1 of the World Series against the Los Angeles Dodgers. on Tuesday night. Houston aces Dallas Keuchel and Justin Verlander will have plenty of rest, too, before the matchup begins at Dodger Stadium. Houston has never won even a single World Series game. The only previous time the Astros made it this far, they were a National League team when they were swept by the Chicago White Sox in 2005. Now, manager A.J. Hinch’s club has a chance to win that elusive first title, while trying to boost a region still recovering from Hurricane Harvey. Houston improved to 6-0 at Minute Maid Park in these playoffs and became the fifth team in major league history to win a seven-game postseason series by winning all four of its home games. Morton bounced back from a loss in Game 3 to allow two hits over five scoreless innings. Starter-turned-postseason reliever McCullers limited the Yankees to just one hit while fanning six over the next four. Carlos Correa and Yuli Gurriel hit consecutive singles after that before Kahnle struck out Gattis. McCann’s two-strike double, which rolled into the corner of right field, cleared the bases to push the lead to 4-0. Gurriel slid to avoid the tag and remained on his belly in a swimming pose at the plate for a few seconds after he was called safe. It was just the second Game 7 in franchise history for the Astros, who dropped Game 7 to the Cardinals in the 2004 NLCS 13 years ago today.